Saperavi is a traditional, widespread grape variety in Georgia; one of the best representatives in the world red wine assortment. Particularly, the high quality table red wine produced from Saperavi in its homeland in Kakheti, while the best strong and dessert wines are made from it in Crimea and Uzbekistan. 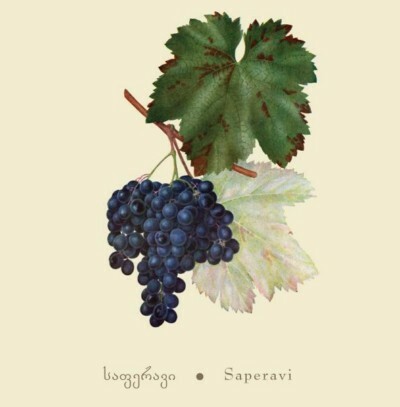 In viticulture literature sources, and also among local viticulturists, Saperavi is known by many other names as this is very old variety and embodied in many variations. The scholars L. Jorjadze, S. Kvariani, and P. Averkini have differentiated the real Saperavi: male, female, Budeshuri-like and Saperavi with small and large berries. According to old historians – Xenophon, Herodotus, Strabo and others, at the time of a dawn of Europe’s political life, viticulture and oenology were widely developed in Georgia. All of these mentioned facts provide great possibilities for considering some currently cultivated varieties as ancient grapevine, or close relatives of ancient grapevines. According to this, Saperavi originated from the eastern coast of the Black Sea – from an old Kolkhetian family and was then transmitted to Eastern and south-eastern Georgia via Kartli, finally being established in Kakheti by the end of 17th century. This supposition is supported by the botanical characteristics of Saperavi by which it is closer to Kolkhetian varieties than that of the Alazani group. Saperavi has is distributed in neighboring countries. In Azerbaijan, mostly throughout the old Georgian province – Saingilo, where Saperavi and Rkatsiteli are currently cultivated on their original root, as high and low formations of vine. In Armenia, Saperavi is less distributed, mostly in adjacent districts of Alaverdi, Shamshadini and Ijevani. In Dagestan (Russia), Saperavi is spread throughout Sakheti, mostly in the Darubandi and Makhachkala districts.